When I found a nutritionist I thought looked good, I gave her a call and explained that I had been diagnosed with CFS and automatically she started talking about ideas she had, and was quite knowledgeable which was great. It wasn’t cheap for mine it was £70 for a initial consolation and £45 for follow ups (Which I have every 2-3 months). Before the first appointment I had to fill out a long medical history form and she asked for me to get a print out from my GP of all my blood test results so she could analyse these before our first appointment. A sheet that had put loads of foods in their nutritional categories, a few different type of sample meal plans. Have protein with every meal inc snacks. Comprehensive gluten re activity test (£306) and cross re activity test (£218) as the gold standard for gluten sensitivity £524. 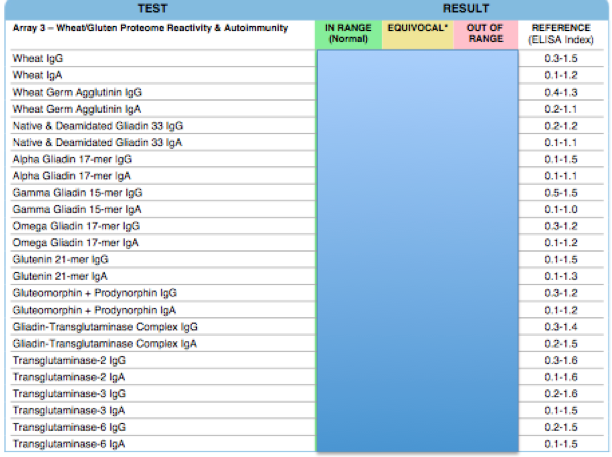 Test levels of inflammation from eating gluten and gluten associated foods. This test isn’t as specific/black and white -£109. Elimination diets – This is a free option technically, but you would need to pay for more nutritionist appointments and also would take a long time. The tests for me showed that I had an allergy to several of the gluten proteins in test one, and thus Rye, Barley, Spelt & Wheat in test two. So a gluten free life for me. Luckily I was fine for all others :).